Griffith Park is an amazing treasure for Angelino hikers, offering more than 50 miles of trails through its thousands of acres of natural terrain. Since coming to work in Los Angeles in 2006, I have come love this wild open space of Griffith Park that sits as an island in a huge sea of urban sprawl. In fact, Griffith Park stands as the largest urban park in the U.S., about five times the size of Central Park in New York City. 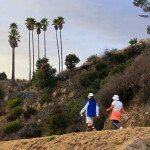 This introduction page will give you a big picture view of hiking in Griffith Park. The links to my various trail write-ups will give you detailed information about hiking specific trails. The extensive network of trails throughout the park makes it easy to customize your own hikes by piecing together various trail options. Welch-born Griffith J. Griffith immigrated to the United States in 1865 and eventually made a fortune in California gold mine speculation. In 1882, Griffith settled in Los Angeles and purchased a 4,071-acre portion of Rancho Los Feliz. In 1896, the civic-minded Griffith willed 3,015 acres of his rancho as a Christmas gift to the people of Los Angeles to be used as parkland. Over the years, the park has expanded to its present 4,107 acres through land donations, city purchases, and the reversion of private land to public domain. When Griffith died on July 7, 1919, he left behind a sizable trust to complete the dreams he had for the park. Griffith Park sits in the eastern Santa Monica Mountain range and covers more than 4,107 acres, most of which is natural terrain. 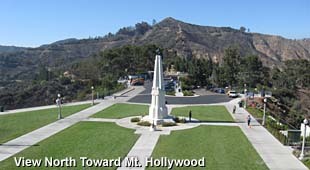 The park's elevation ranges from 384 feet to 1,820-foot summit of Cahuenga Peak. The park's complex of ridges, canyons, creeks, springs, and seeps provide for rich diversity in flora (plants) and fauna (animals). 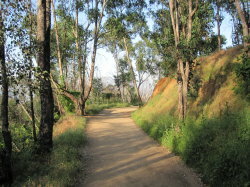 Dirt Roads - When reading about "trails" in Griffith Park, keep in mind that this usually means wide fire roads. If you are a not particularly fond of dirt roads as hiking trails, Griffith Park may be worth an exception. Conventional Narrow Trails - There are only a few trails in the park which are typical hiking trails (mountain bikers call these single tracks). Examples include Bee Rock Trail, Mulholland Ridge Trail, and Upper Vermont Canyon Trail. Use Trails - There are many informal trails webbing through the park. They are called "use paths" because they develop by use. In most cases they were not engineered nor are they formerly maintained. Please beware that these paths can pose some risks from steepness, loose footing, and obstructions. And you could end up in someplace where you don't want to be. If you become disabled you may not be readily found by passersby. If you choose to follow these routes, understand the risks, know your abilities, and use a map. And be aware that in some cases use paths also cause erosion damage. People - What sets Griffith Park apart from the typical trails that one might find in the San Gabriel Mountains, is that the vast majority of users don't appear to be your typical hikers. For the most part, they are walkers, joggers, doggers, runners, bikers, and equestrians. You will see very few hiking boots, CamalBaks, and the typical clothes and gear that you would see on someone venturing to the top of Mt. Baldy or forging deep into the San Gabriel Wilderness. I suspect you would be hard pressed to find one compass for every 100 trail users. And as I have asked questions of many trail users, I find that for the most part, they don't know the names of trails or peaks or canyons or ridges, nor do they know mileages or elevations. They simply enjoy wandering around their beloved backyard. And that's great! If solitude is what you are looking for, Griffith Park is not particularly the place, at least on the main trails. When I told a friend that I took a hike in Griffith Park, he asked if I was hiking alone. Well, I was hiking solo, but hardly alone. On that particular Thursday late afternoon there were dozens and dozens of others. Dogs - A city ordnance (LAMC 63.44-B,2.C) requires dog owners to keep their dogs on a lease in the park except in designated areas. This ordinance is clearly communicated throughout the park. Unfortunately there are many disrespectful dog owners who violate the law and infringe on the rights of others to enjoy the park. Be assertive in reminding dog owners to keep their dogs on a lease, regardless of how "good" their dogs are. I have thoroughly enjoyed my hikes in Griffith Park and sometimes use glowing language to describe the hikes. However, I would rate hikes in Griffith Park as B-list. For me they are fun to do after work occasionally during the long-daylight season since my office is only about six miles from the park. But on a weekend when I have a chunk of primetime to spend hiking, I most likely would not drive 25 miles to hike in Griffith Park. I'd head to the San Gabriels or San Bernardinos, where the trails are narrower, the topographic grander, and the sense of isolation and wilderness much greater. If you live near Griffith Park and the park trials are the only hikes you do, I'd encourage you to break out of the rut and try the San Gabriels. I think you may find a rich hiking experience that's a few pegs above strolling around our beloved park. Just a suggestion. Griffith Park lies just west of the Golden State Freeway (I-5), roughly between Los Feliz Boulevard on the south and the Ventura Freeway (SR 134) on the north. From SR 134 eastbound: Forest Lawn Drive and Victory Blvd. From 101 southbound: Exit 9A toward Vine St., merge onto S Hollywood Fwy., continue onto Franklin Ave., drive east to Western Ave, turn left (north) and drive to Los Feliz Blvd. From 101 northbound: Hollywood Blvd., turn right (east), drive east to Western Ave, turn left (north) and drive to Los Feliz Blvd. 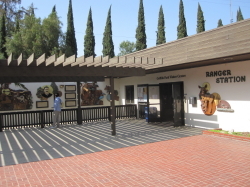 The visitor center hosts splendid nature exhibits and provides maps and other information about the park. Park Hours: The official park information says, "Griffith Park is open to the public from 5 a.m. to 10:30 p.m. daily. Bridle trails, hiking paths and mountain roads close at sunset." Griffith Park - Official Website.